1. Preheat the oven to 180°C, gas mark 4. Tip the tortillas into a large heatproof dish and pour over the tomato and chilli sauce. Top with the beans and sweetcorn. 2. Skin, stone and cube the avocados and scatter over the top of the other ingredients. Sprinkle with the cheese and bake for 15 minutes until piping hot. 3. Scatter over the jalapenos and coriander and serve warm. 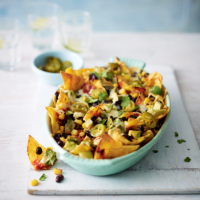 Push the boat out with a creamy dip for spooning over the nachos – mix together soured cream and finely chopped salad onions or chives, and add a squeeze of lemon or lime juice.